Exploration of deposits is the classic field of geophysics. The methods have been adapted to investigate also the small-scale deposits of the industrial minerals like sand, gravel and clay. 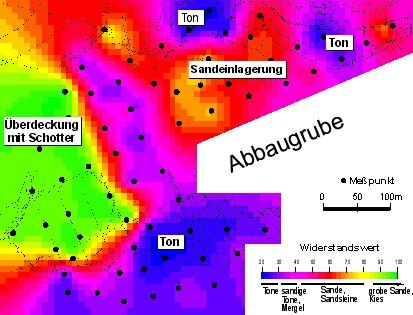 We have completed more than 150 geophysical investigation for the mineral industry. 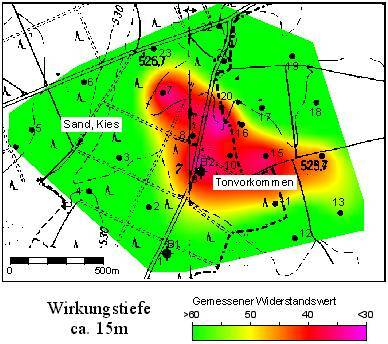 Left: Clay deposit in sands, low resistivities (red) delineate the extent near the surface. 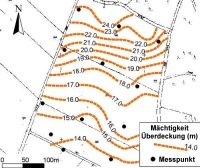 Contour map of overburden thickness, calculated from resistivity depth sounding and verified by drillings. The methods - mainly resistivity - allow a fast and cost-effective investigation, especially over large areas. The principal objective is always to reduce drilling to a minimum. 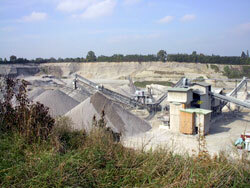 Volumes of overburden and raw material can be calculated. Left: Investigation of a clay deposit. Cross section of a gypsum deposit from resistivity depth soundings and drillings.